RPOs – what they are, which NFL team used them best in 2017? For all the publicity that run-pass options (RPOs) have gained in recent years, there’s still a distinct lack of clarity in how they work. Even my boss, Cris Collinsworth, was guilty of misidentifying them on the broadcast for Super Bowl LII (don’t fire me, please!). The vast majority are fairly simple to see in real time but not without watching specifically for them to the exclusion of anything else, so it is easy to see how they can be misidentified live. The first means that almost all of the time, offensive linemen will be moving forward at the snap and not backwards (although that’s not the case with draw RPOs which are more popular at the college level). The latter means that certain split receivers aren’t run-blocking, even though they may still be screen-blocking. If both of those two aspects are present, you’ve got an RPO. Now that we know what they are, let’s take a look at exactly why they work. The answer is rooted in elementary mathematics. If an offense has more blockers than the defense has defenders – whether that be on a screen or a run – there’s a good chance the offense will be successful. If the defense has the numbers advantage, there’s a good chance the play will fail. A well-designed and well-executed RPO makes sure that numbers advantage is always present for the offense. That well-designed RPO will usually have what’s called a conflict defender. This isn’t always the case as the quarterback can also make the decision on whether to pull the ball or not based on the coverage call itself. The conflict defender though is usually what defines what the quarterback does with the ball. If that defender – who is usually a linebacker, safety or slot corner – extends wide enough from the box, the quarterback hands the ball off. If the conflict defender stays in tight to play the run, the quarterback pulls and throws. The Jacksonville Jaguars shredded the New England Patriots in the first half of the AFC Championship game this past season with the same RPO on four separate occasions. The play thrived because the Patriots didn’t have their conflict defender in a realistic position to succeed. Patrick Chung (circled in red) was that player in the first RPO shown below. He’s expected to play both the run and the screen based on the coverage called. As soon as he steps to defend the run, the screen is going to hit so quickly in the opposite direction to where he is heading, that he’s toast. It’s free yards that are there solely via play design. Now that we know the ins and outs of the almighty RPO, let’s look at who deployed them the most in 2017. It’s no surprise that the Andy Reid coaching tree ends up at No. 1 & 2 on this list. I broke down the Eagles extensive usage heading into the Super Bowl. For Doug Pederson, no run concept could not have an RPO attached to it and he even stole the aforementioned Jaguars play on the second play of the Super Bowl – the only such time they ran it all season. As with anything in the NFL schematically – there’s not just one way to do something. Some of the best offensive teams in the NFL, as you can see below, did not have the run-pass option as crucial cog in their offense whatsoever. As far as success-wise, you can see the top five and bottom five teams on RPO pass attempts shown below (minimum 10 attempts). 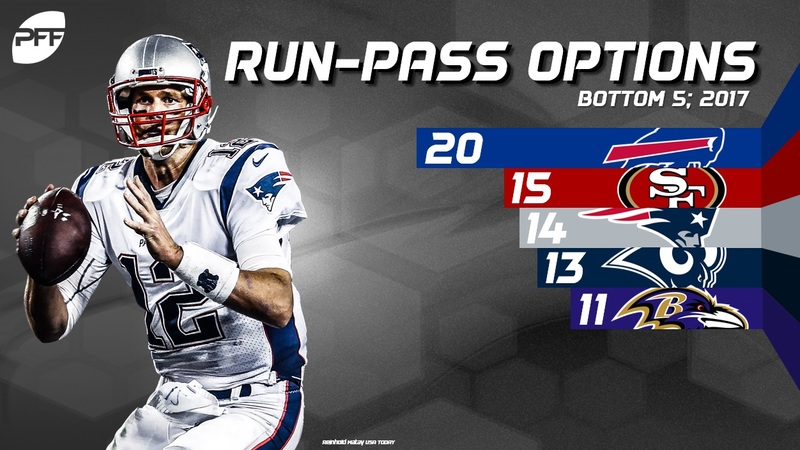 The Patriots offense has maintained their dominance without ever fully embracing the RPO while Sean McVay and Kyle Shanahan have established themselves as two of the best offensive minds in the league while skirting RPOs for the most part. When the quarterback did pull, league-wide last year, the average yards per attempt was 6.52 and there was a 78.8 completion percentage. Once again, easy money. 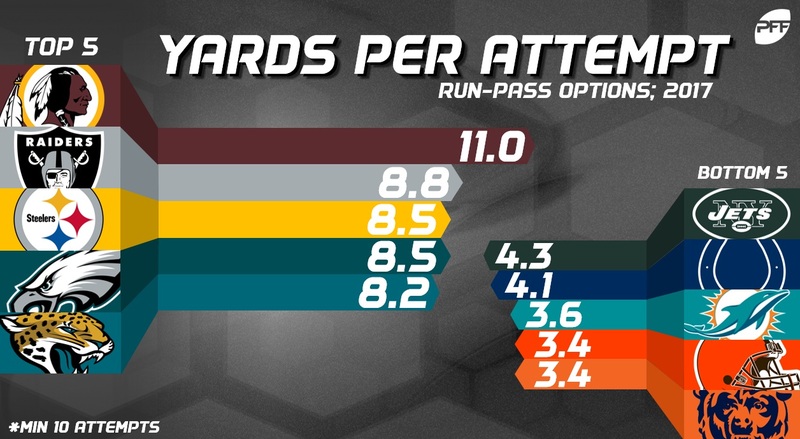 On average, RPOs turned into passes 28.2 percent of the time and runs 71.8 percent of time last season. 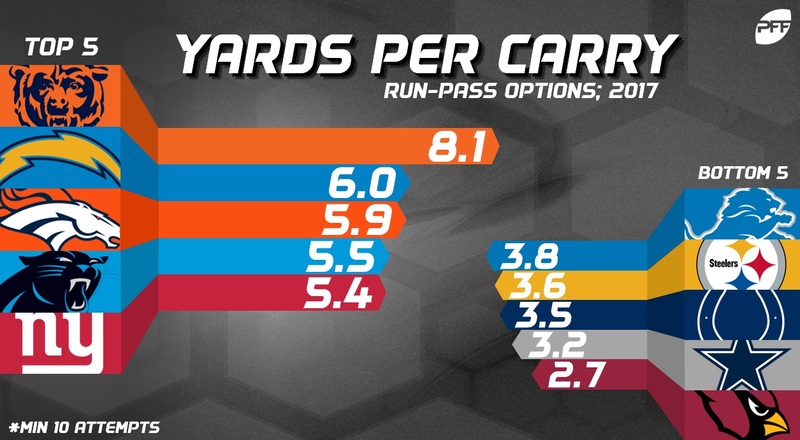 The average run still netted a cool 4.55 yards per carry. Below you can see the teams that had the most and least success on those runs (minimum 10 attempts). It’s interesting that the Chicago Bears end up at the top of this list as they will likely be among the most RPO-heavy teams in the NFL this upcoming season with the appointment of Matt Nagy as head coach. The conclusion here is quite obvious: run-pass options, similar to read-options, produce vastly superior results to traditional runs. League-wide last season, RPOs gained 5.01 yards per play compared to 3.95 yards per carry on handoffs with no option look (even taking away short yardage situations that number only goes to 4.14 yards per carry). One might respond ‘duh, you’re including pass plays.’ To which I’d reply that’s precisely the point. 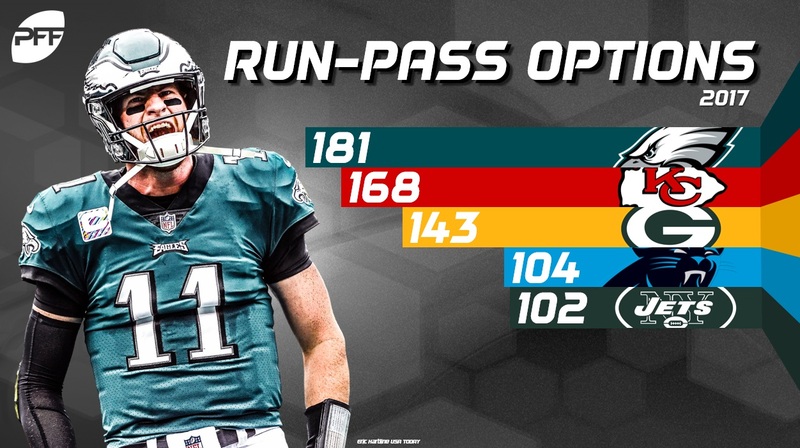 Those passes are essentially an extension of the run game and a very high percent completion rate because they are throws any quarterback in the league should be able to make (screens/slants/etc.). The league-wide average depth of target on RPOs was 1.85 yards downfield and they only get thrown if the run is unlikely to be successful. For these reasons, RPOs won’t be going anywhere anytime soon. With their immense success for the reigning Super Bowl champs, expect even more of them in 2018.